Planning a destination wedding in the Middle East comes as the first option today due to the many facilities they offer. 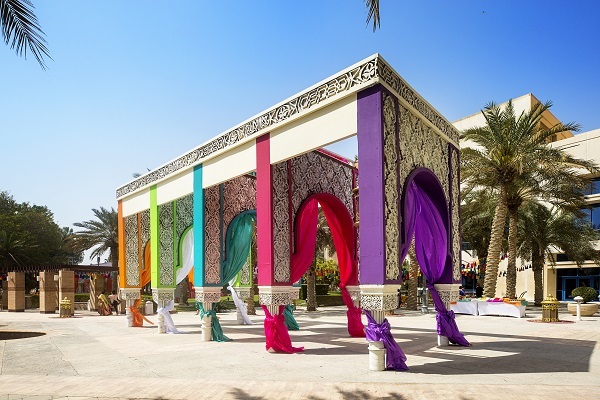 And after looking at the array of hotels and resorts that match perfectly for Indian weddings, Middle East becomes the best option to host a destination Indian wedding. We searched for the top nine hotels and resorts in the Middle East that fit perfectly for a destination wedding that is not only a little closer to India but also offers a cultural balance and freshness in the ambience and decor. Here is the list hotels that caught our eyes. 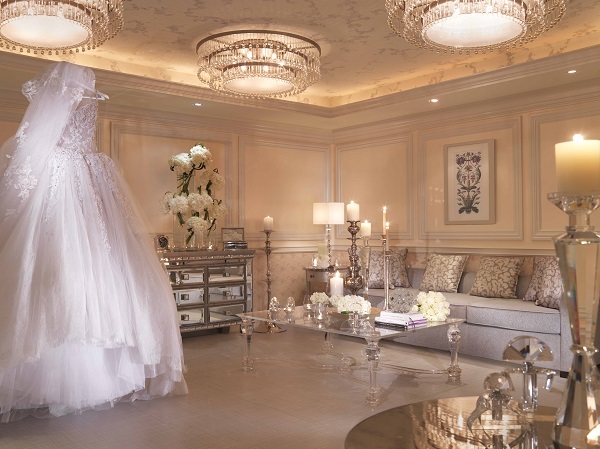 Your wedding day memories will stay with you forever at The Ritz-Carlton, Doha. Such timeless reminiscences deserve the most magnificent of settings, and the Ritz-Carlton, Doha is the perfect choice of venue for your dream day. The Ritz-Carlton, Doha promises you and your guests an oasis of luxury and tranquillity, just 30 minutes from Doha International Airport. Extensive landscaped gardens and our magnificent ballrooms provide an abundance of picturesque settings for your Sangeet and Haldi ceremonies. Our aim is to create a day that will live on in memory for a lifetime. The first step is to create the perfect setting: our palatial Al Wosail and Al Mukhtasr ballrooms, magnificent Palm Gardens, and tranquil Fountain Courtyard provide an unmatched choice of settings for the most unforgettable celebrations, guest gatherings and entertainment. A celebration of love deserves to be memorable for both you and your guests, so we have crafted the perfect Indian Wedding experience to redefine your expectations for opulence and intuitive service. From the sangeet to the “pheras” to the “bidaai”, Emirates Palace provides a luxuriously exclusive setting for an unforgettable traditional wedding ceremony. 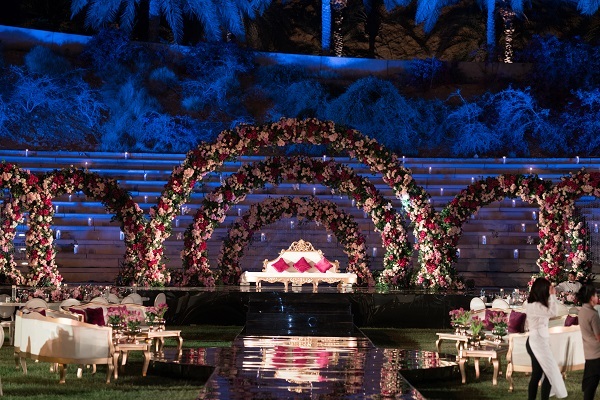 There’s nothing more glamorous and enchanting than an Indian wedding and at JA Jebel Ali Golf Resort, it is our commitment to ensure that we recreate the same grandeur that makes every Indian wedding unforgettable. Conveniently located between Dubai and Abu Dhabi, the resort is home to an impressive portfolio of indoor and outdoor venues spread across 128 acres of lush gardens, an 800m private beach and an exclusive beach club. 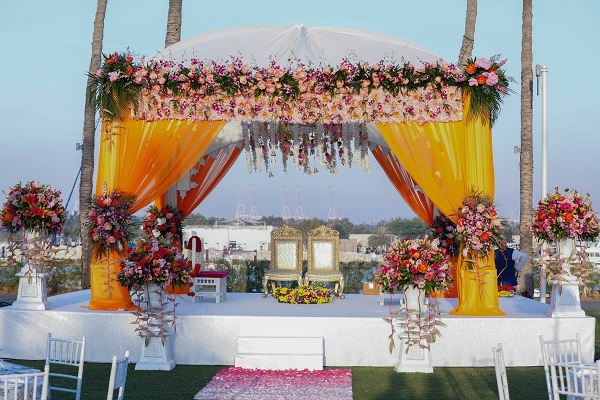 With a team of experienced wedding specialists, who understand the intricacies of traditional Indian ceremonies, JA Jebel Ali Golf Resort is a one of a kind wedding destination to host your big Indian wedding. Palazzo Versace Dubai gives an extremely unique experience as it’s the only venue that offers a complete Versace lifestyle experience – right from the entrance to the hallways, rooms and suites, ballroom as well as furniture, linens, crockery, cutlery and glassware. 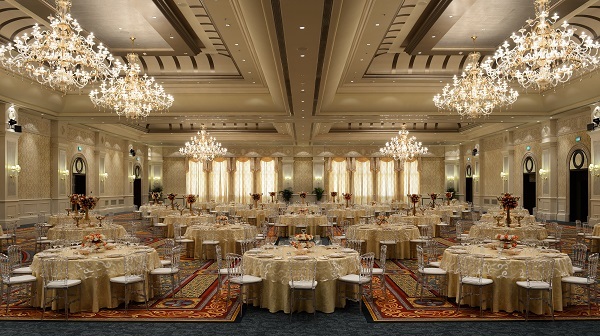 Palazzo Versace Dubai is the most sought-after wedding venues for brides and grooms with refined taste due to its elegant Instagrammable interiors as well as its lush garden overlooking the Dubai Creek. The hotel also offers different pockets of venues and areas for different pre-wedding functions leading up to the wedding day. 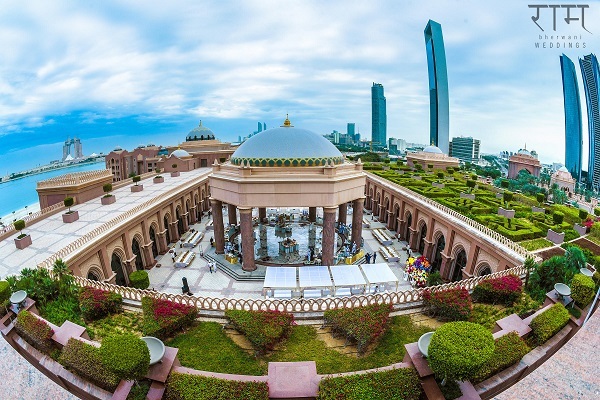 A destination within a destination, Four Seasons Hotel Bahrain Bay is the ideal wedding venue for a big scale Indian wedding in the heart of the capital city of Manama. This iconic architectural statement on its own 12 hectares private island provides the utmost privacy for a fairytale wedding. 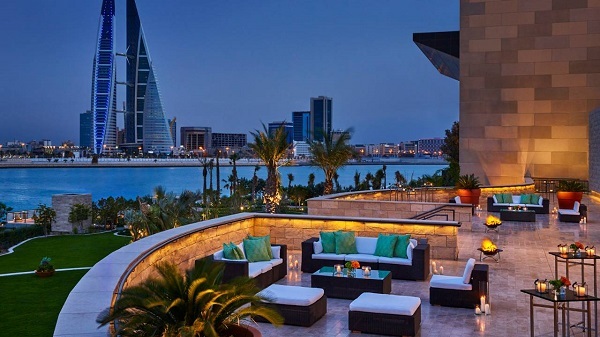 The unique indoor-outdoor venues overlooking the Manama skyline including four spacious rooms located on the 50th and 51st floors – can be perfectly set for Saree draping, hair saloon or a gift room. An extraordinary buyout allows guests to transform the entire beach resort into “their own Four Seasons” where the hotel employees will exclusively be serving the wedding guests around the clock. The preparation of the magical wedding series will be personally led by the Senior Catering Sales Manager Steve Dias who will be taking care of every detail before, during and after the wedding to deliver a true Four Seasons experience. 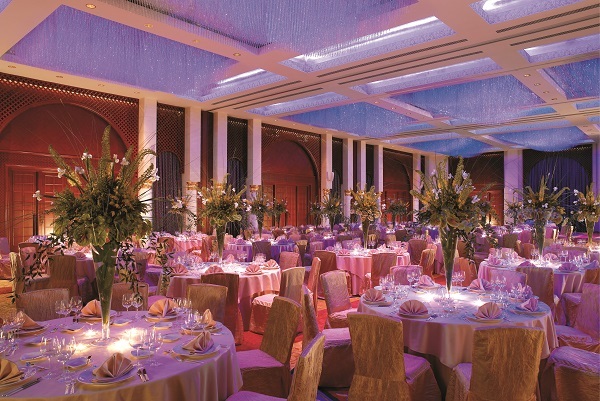 The exclusivity and glamour of Park Hyatt Dubai makes it the ideal Indian wedding destination. The resort offers five stunning venues ranging from indoor to outdoor in unique luxurious settings. 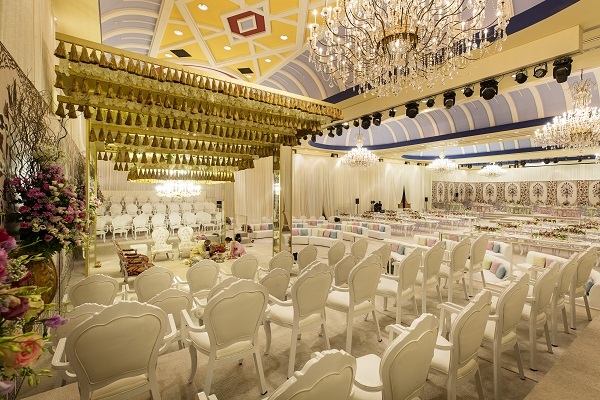 The outdoor gardens such as the Palm Garden, Fountain Garden and Marina Garden are ideal for hosting the mehndi and sangeet functions and offer picturesque backdrops for the mandap and the pheras whereas the indoor Creek Ballroom delivers an extensive venue to bring in grand wedding celebrations and receptions. Personalized service, genuine care and spectacular bespoke cuisine makes every destination wedding an unforgettable experience. Featuring breathtaking views of the Sheikh Zayed Grand Mosque and the Al Maqta’a creek, The Ritz-Carlton Abu Dhabi, Grand Canal, offers unmatched service and breathtaking scenery in outdoor and indoor wedding venues: from the intimate Olive Garden, tranquil Grand Canal Beach or striking Pool Gardens to the stunning Roma Ballroom with a private elevator to the exclusive Bridal Suite, the hotel provides a range of romantic locations ideally suited to wedding celebrations of almost any size. Nested in the secluded, breathtaking Bay of Jissah and overlooking the dramatic Hajar mountains, Shangri-La Barr Al Jissah Resort & Spa is your ultimate nuptial destination in Muscat. 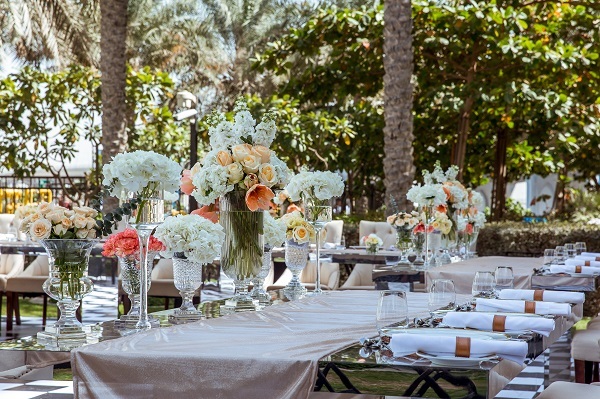 Stylishly appointed, the 1,056-square-metre Barr Al Jissah Ballroom features a large pre-function area and an outdoor terrace that faces the beach and can accommodate up to 850 guests for large weddings with indoor requirements. Outdoor venues are also available with the Al Midan Amphitheatre being a highlight allowing seating for 1,000 people. While Turtle Beach showcases unrivalled views of the Gulf of Oman. The delectable cuisine and our exquisite culinary journey with the Indian Signature Buffet, prepared by our talented chefs, is undoubtedly the highlight of our Indian weddings. Marsa Malaz Kempinski is the palatial icon of luxury hospitality in Qatar. From an incomparable service with your personal butler … the most spacious rooms and suites in the country, to a ballroom setting that is simply beyond compare. Your own dedicated wedding planner is delighted to provide you and your family with the utmost support, before, during and after your wedding day. Tell them your dream and they are managing, organizing and coordinating the finest details to your perfection. Sublime flower displays that explode in a kaleidoscope of sumptuous color. Everything truly luxurious.